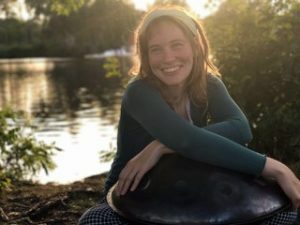 Sagit Zilberman is performing a free concert, “Songs of Peace,” on Thursday, February 14 at 6:30 pm at the George S. Woods Community Center. Originally from Israel, Sagit allows her cultural roots to mix with her audience’s favorite songs. She plays a myriad of instruments such as the Swiss Hand-Pan, steel drum, a simple recorder, and a jazzy saxophone. Sagit received her Bachelor’s of music from Berklee College of Music in Boston. She has performed all over Poland, Germany, and Ukraine, echoing the musical sounds and lyrics of her native Israeli-Jewish traditions. “Songs of Peace” tells the story of a little boy from Africa. As he visits different countries, he realizes he wants to return home. It’s a story of independence, appreciation for nature, life, wit and wisdom, rhythm, listening to our passions, hearts and bodies, and communing with others along the journey.